Beyond the Call of Duty ends up feeling like a shadow of its former self, being both shorter and more frustrating than the original. Just about every good game gets an expansion pack or a sequel, not just because it's profitable, but because it's easy. The good idea's already there, and the existing technology can be recycled to make a game that feels comfortably familiar but with new and exciting content. Recent expansion packs like Starcraft: Brood War, as well as sequels like Myth II and Fallout 2, all bettered their predecessors. But Commandos: Beyond the Call of Duty, a standalone expansion to Behind Enemy Lines, ends up feeling like a shadow of its former self, being both shorter and more frustrating than the original. The original Commandos was a surprise hit. It cleverly combined strategy, puzzle, and action elements with great graphics and an all-too-apt subject matter, and while there was some debate over just what kind of game it was trying to be, most found its demand for planning and precision to be both unusual and exciting. At a glance, Commandos: Beyond the Call of Duty is more of the same, with a few new bells and whistles. But the fact is, you can have too much of a good thing. The original Commandos was a great game because each member of the squad was highly specialized. A couple of them, the Green Beret and the spy, ended up doing most of the work, but that was OK, because the others like the marine and the sapper got their moments in the spotlight. In Beyond the Call of Duty, though, each character gains the ability to throw a stone or toss a pack of cigarettes as a means of distracting the unassuming enemy. Likewise, every commando can now force a captured nazi to do his bidding, so long as the hostage remains within the range of the commando's sidearm. The hostage can be used to distract his comrades, so that one of your squad can sneak past or sneak in for the kill. These new abilities are fairly interesting, but the fact that every commando has them clouds the sense that your soldiers are working as unique and complementary components of some perfectly tuned machine. The commandos' roles become less clear, and with that, some of the game's appeal slips away. It also doesn't help that the game is even more difficult than the first. It's tempting to justify the excessive difficulty by the fact that the game contains only eight missions (the original had more than twice as many), but that would be a solution to the wrong problem. Besides, nobody complained that the original Commandos was too easy - all of its missions were difficult, though some were far more difficult than others. Nevertheless, all its missions could eventually be completed so long as you were patient, and the game didn't get too frustrating because each mission could be reduced to a series of smaller situations, and you'd rarely get stuck at any one point for too long. On the other hand, Beyond the Call of Duty starts out frustrating and just stays there. These missions don't just seem difficult, but downright unfair. In the first mission, if you don't save a sniper rifle round until the very last point, you probably won't be able to clear the minefield and escape; and there's no real way to anticipate this eventuality, so if somebody didn't warn you, you'd end up having to restart. At other times, there are so many enemy troops patrolling an area that it doesn't seem like there's an appropriate way of resolving the situation. You'll wonder what would happen if maybe you threw the cigarettes, the stone, and used the decoy all at the same time, while a hostage distracted everybody.... But unfortunately, much like the first game, Beyond the Call of Duty's interface doesn't easily lend itself to multitasking, since the commandos are slow to respond and need to be micromanaged. You absolutely must coordinate your troops in this game, but it isn't any easier than before, no thanks to the fact that all the keyboard hotkeys were shifted around. (While the new layout is a little more logical than the original's, it's inexplicable why the designers didn't just let you customize the keyboard layout.) So the control feels more cumbersome than before, since you need especially impeccable timing and coordination, but the interface won't allow it. And even when you finally get through a mission, you won't feel very good about it since you won't be able to shake the feeling that you've figured out something the designers didn't expect you to. The original Commandos was satisfying because its puzzle-like situations had specific solutions. These missions feel clumsier by comparison, requiring at least as much luck as finesse, although the maps themselves all look distinctly beautiful. On the other hand, maybe the problem is the awful new voice-acting. 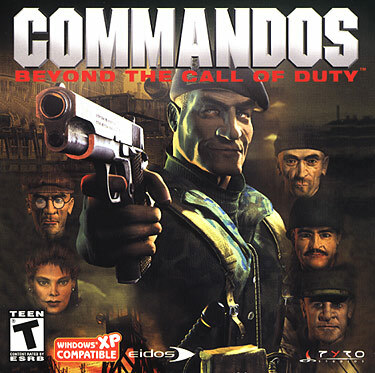 The original Commandos had a problem with repetitive speech, and that problem lingers in Beyond the Call of Duty. Only now, not only does every one of your troops say the same thing over and over, but every last one of them sounds ridiculous. At least there's good musical accompaniment during each mission, of the appropriate symphonic military variety. Meanwhile, the game's packaging gives top billing to a new female commando "seductress," whose inclusion raises numerous concerns, not the least of which is the fact that she is touted as a key feature yet doesn't even play a significant role in the game. In spite of everything, it's inaccurate to say that Beyond the Call of Duty is far worse than the original. If anything, the two games are difficult to distinguish, so fans of the original will enjoy Beyond the Call of Duty because of its inherent similarity to its predecessor. And to be fair, there are certain subtle new twists to this game that add strategic depth, such as the spy's ability to wear several types of uniforms. But at the same time, most of the subtle changes have adverse effects and make Beyond the Call of Duty feel like more of the same in the worst kind of way. Alt + Shift + L Write Info in "memlin.dat"
https://www.facebook.com/temi.mesi. Picture Window theme. Theme images by konradlew. Powered by Blogger.